Solar rotation and polar flows of the Sun as deduced from measurements by MDI. 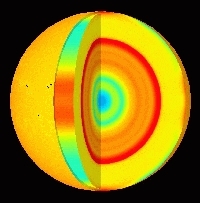 The cutaway reveals rotation speed inside the Sun. The left side of the image represents the difference in rotation speed between various areas on the Sun. Red-yellow is faster than average and blue is slower than average. The light orange bands are zones that are moving slightly faster than their surroundings. The new SOHO observations indicate that these extend down approximately 20,000 km into the Sun. Sunspots, caused by disturbances in the solar magnetic field, tend to form at the edge of these bands.